Born of Shane's own experiences of being bullied as a child, "To This Day" expresses the profound and lasting effect of bullying on an individual, while affirming the strength and inner resources that allow people to move beyond the experience. A heartfelt preface and afterword, along with resources for kids affected by bullying, make this book an invaluable centerpiece of the anti-bullying movement. Like the summary says, To This Day is the book adaptation of a spoken word piece/music video that made the internet rounds last year. I remember seeing it posted a few times on Tumblr, but it took me a while to get around to it, because it's about 7 minutes long and I have the attention span of a very fidgety small child sometimes. Of course, when I finally watched it, I was definitely moved to tears by the poem. Even reading it now, I get a little choked up, because it describes what so many people I know went through, what so many people still endure today. 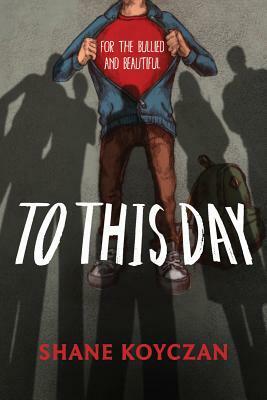 To This Day is a powerful look at bullying and the way it effects people long after the last insult, the last practical joke. The poem definitely resonated with me, no matter what format I experience it in. I like the fact that To This Day doesn't just blindly trot out the "it gets better" line. Sometimes, it is a long, uphill battle to "better", and sometimes you're carrying baggage from the many ways, small and big, that people have hurt you over the course of your life. Check this book out -- each two-page spread is illustrated by a different artist, in the same way that the video was animated by many different artists. For any other project, this would feel disjointed, but something like this, it's meaningful - I think it makes the message more universal, to show how so many people experience and can identify with the book's topics. You can read the poem online, you can watch the video on Youtube, and I would highly recommend picking up the book version. This is a great, quick read for people of all ages, and I think could start some great discussions between teens and parents. And for any adult still trying to heal from the way you were treated -- by peers, by family, by complete strangers -- please pick this one up. You are not alone.